The Most Excellent, Extreme, Exterior Door. 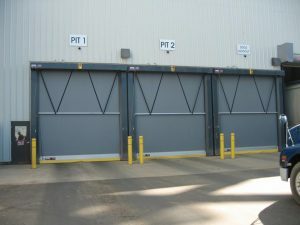 The Fast-Seal door was the first high-speed rolling door that was impact resistant, and it remains the best exterior high-speed door in the industry. The Fast-Seal is manufactured with a patented break-away bar that runs along the bottom and a counterbalance/tension system that makes it resistant to pressure and winds. Living up to its name as a high-speed, high-performance door, the unique AC drive and counterbalanced design allows for operating speeds up to 50 inches per second. For information on additional features, options and benefits, contact E-Distribution.